What is Library Advocacy Day? Library Advocacy Day (LAD) is a day that the Missouri Library Association sets aside each year for library representatives to speak with their respective State Representatives and Senators to discuss the importance of all libraries. The day is open to library staff, trustees, and friends across the state of Missouri. 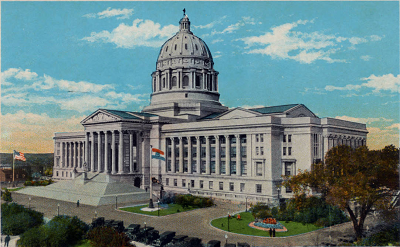 The event occurs in Jefferson City, starting at the Interpretative Center in the Secretary of State’s office and continuing to the capitol building where face-to-face meetings occur. The face-to-face meetings is where the magic happens. It is our opportunity to brag about how important libraries are in our communities. It is also our opportunity to advocate for continued library funding. If you are at a larger library, funding may not seem as important to you as it is for smaller libraries. However, larger libraries have a unique position in that you may be able to provide more extensive services to individuals in your communities who need our services the most. Those individuals are also important to our legislators. They need to improve job skills, continue their education, build early literacy skills in preparation for school, register to vote, become citizens, and contribute to the economy. Of course, this list goes on and on, but these results/goals are impactful to legislators. Through meetings with elected officials, we raise awareness of the importance of State Aide to Public Libraries and the services of the Missouri State Library. By coming together in Jefferson City on Missouri Library Advocacy Day, we promote libraries in a visible way, and, by our numbers, show the importance of libraries state-wide. Face-to-face discussion is the most effective means of communication and is essential to the establishment of a solid working relationship. While this event is important, it is only one communication with your legislators. Your meeting with your legislator should make it easier to contact him/her during the session as issues arise and we ask for your support. Building long term relationships with your legislators is the key to effective communication. This event is a great opportunity to begin building relationships with your elected officials. If you would like help making those first contacts or tips on nurturing your new relationships with legislators, please contact me. The legislative committee is happy to help. This year, we would also like feedback from the membership about the day and advocacy in general. To fill out this 8 question survey.